rway and not deep in the woods. I usually go in the woods, however my progress has kept me on the edge of the woods. 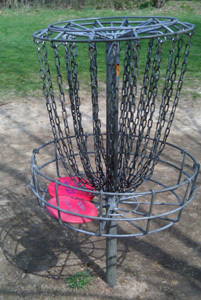 This is where my disc landed after my first throw from the pad. 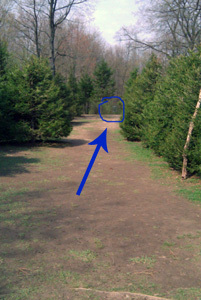 If you look, you can see where the basket is. It took me two more throws to get in. backhand (like you normally throw a frisbee) or forehand (which looks really weird, but can help you when the fairway goes to the right). Whatever way you throw it, if you let the disc go too soon or not soon enough the disc will go way off and send you in the crap. I’m not sure what the story was today, but I kept letting go at the wrong time. Something to work on for the future. I did however get a bit better with the forehand throw, which is pretty difficult to do (at least for me). I’m not use to that throw, it’s easier to throw across the body than kinda next to the body. But, watching a lot of other golfers you really get to see the benefit of that throw. I’m not great at it, the disc usually comes out of my hand pretty wobbly, but it’s starting to get a little less wobbly and it’s starting to cut at the right time. I took some pictures with my phone, which I will post tomorrow. There wasn’t many photos, I was concentrating on the game, but at least they are something. The pictures are up. 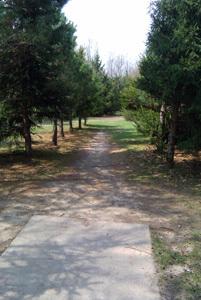 I only took some pictures of hole 15 and hole 18, but at least you can see some of what we saw. I’m sure as I go further along in this blog I’ll have a complete set of photos from Oshtemo. Anyone have any advice on throwing? Anyone go out today? And we have finished. It feels pretty good to finish a game, whether you did good or bad. Here are our two putters enjoying the basket.